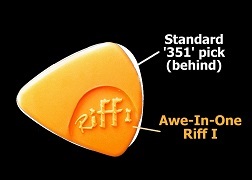 If you have been using standard size flat picks - the '351' shape - these are the picks you must have for a totally new experience. Typical of Awe-In-One, the above five colours represent five specially selected materials determining their flexibility and tone. 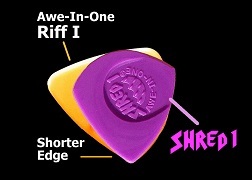 The illustration below will give you a good feel of the Riff I. 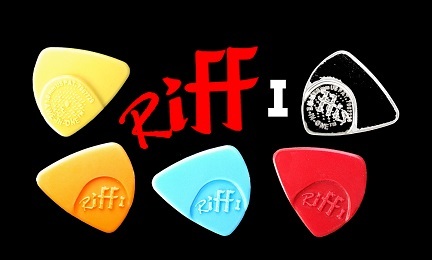 The Riff I is slightly smaller than the standard '351' size picks, and you have 2 extra playing edges! The reach of the shorter edge is similar to our Shred I, and this opens up another Speed Lane. great ergonomics for hybrid picking- thanks to the unique indent!